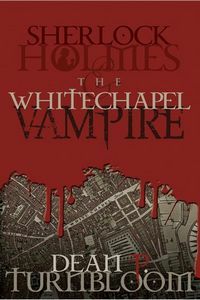 Sherlock Holmes and the Whitechapel Vampire by Dean P. Turnbloom: Synopsis and Online Purchase Options. Synopsis (from the publisher): In this fast-paced novel set in the Victorian London of 1888, a string of heinous murders in London's East End has Inspector Abberline of Scotland Yard baffled and his boss, Commissioner Sir Charles Warren furious that no arrests have been made of the culprit the newspapers have dubbed "Jack the Ripper". With pressure for an arrest mounting, a reluctant Abberline calls on Sherlock Holmes and Dr. Watson for assistance. Using a combination of intuition, luck, and good old-fashioned police work, the trail they follow leads them directly to Baron Antonio Barlucci. The wealthy Italian financier is a long time family friend of Sir Charles and a ruthless vampire. His trail of blood stretches from Paris to London and if he's not captured soon an innocent young Italian immigrant will swing from the gallows for a murder he didn't commit. The baron, though, has other plans. He's come to London to enlist the aid of a young American, Dr. Alan Tremaine, to cure his vampirism. To complicate matters, the baron has fallen in love with Sir Charles's niece, Abigail Drake.